Instant Imprints Woodstock, GA | Custom T-Shirts, Embroidery, Signs and More! At Instant Imprints Towne Lake in Woodstock, Georgia, our customers come to us when they want to be more visible to their customers. We create that visibility five different ways: Branded Apparel (embroidery), Signs & Banners, Promotional Products, Custom T-Shirts and Print Services. Every business knows the power of good promotion. This is why it’s crucial to use the highest quality promotional items around! Your Towne Lake Instant Imprints is proud to serve Woodstock with superior custom t-shirts, printing services, promotional products, custom banners and branded embroidery items, so that you can bring your brand visibility to the next level. Our Woodstock Image Experts are enthusiastic about helping you every step of the way. Your project is completed start to finish with professional help, right here in Woodstock. At Instant Imprints in Woodstock, we pride ourselves in getting your job done right and on time. We deliver a level of service that only an industry leader can provide, with the local attention to detail of a Georgia Image Expert. We know that every promotional plan is unique, which is why we strive to understand your project and swiftly answer any questions you may have. Our wide line of promotional items helps you to integrate your brand into the daily lives of your customers, so you can connect with them in a deeper way. Custom t-shirts are renowned for their ability to turn heads, wherever they are. Instant Imprints in Woodstock has the latest and greatest in custom t-shirt technology so you can use the production method that is perfect for your project. Not sure which type of custom tee to use? No worries! Our Woodstock Image experts are happy to help you pick the right print. If you’re looking for another level of style and personalization, our custom embroidery service is second to none. Just ask your phone, “Where’s the best custom t-shirt service near me?” To find Instant Imprints! Nothing beats a well-made sign for attracting passersby into your storefront. Our sign and banner service can help you to reach more prospective customers, wherever they may be. No matter what type of sign or banner you’re looking for, we can make it happen. 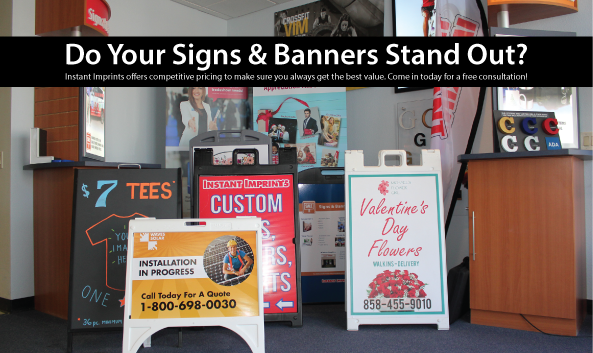 From sidewalk signs to billboard banners, we can tailor your banner to suit your needs. Our Woodstock Image Experts are happy to help you choose the perfect combination of materials, colors and fonts to make your sign most effective! When you’re ready to take your business to the next level of brand visibility, come by our Towne Lake Showroom, give us a call at (678) 695-7988 or request a quote online today!